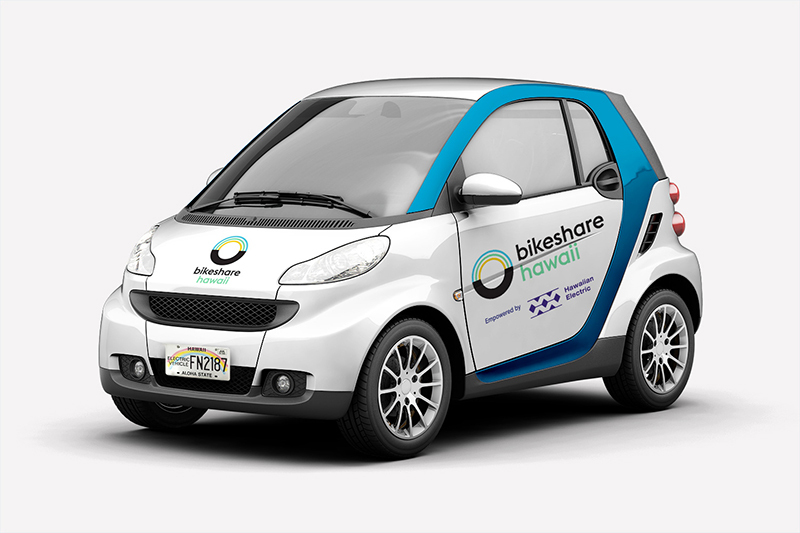 HONOLULU – Bikeshare Hawaii today accepted a symbolic key to two electric‐powered Smart cars and a $25,000 check, for a combined donation valued at $50,000, from the Hawaiian Electric Industries (HEI) Charitable Foundation. The $25,000 will be used to purchase bike trailers and other equipment to transport Bikeshare Hawaii’s fleet of bicycles and maintain the network of bike docking stations coming to urban Honolulu. “When people opt for bikeshare, it reduces our dependence on fossil fuels and the same is true of electric vehicles. The donation of electric vehicles aligns well with our goal to give people eco‐friendly transportation alternatives,” said McCarney. Bikeshare Hawaii is a nonprofit, public‐private partnership to bring a new, practical transportation option to urban Honolulu that provides economic, environmental, health and ultimate convenience benefits for residents and visitors alike. In December 2015, Bikeshare Hawaii selected PBSC Urban Solutions as the bicycle and docking station provider. Bikeshare Hawaii plans to launch in 2017. The system initially will include a network of approximately 1,400 bikes at 150 strategically placed stations from Waikiki to Chinatown, covering an area of approximately 7.2 square miles. The major goal for the system is convenient mobility for people who live, work, or play in urban Honolulu. Docking stations will be about two to three blocks apart and be so common that a customer never needs to worry about where to pick up or drop off a bike. The bikes are designed for short trips of one to four miles and will provide a cheaper, healthier, friendlier and often faster alternative to driving. Bikeshare Hawaii is a not‐for‐profit 501(c)3 organization aiming to launch and manage a bikeshare program in Hawaii through strong public‐private partnerships. Bikeshare Hawaii is currently supported by the Ulupono Initiative, the State of Hawaii, the City and County of Honolulu, the Environmental Protection Agency, and Hawaii Pacific University. Many other organizations are also providing financial and in‐kind support. As a community‐based nonprofit organization, Bikeshare Hawaii actively seeks other partnerships and sponsors to launch operations in 2017, and will maintain and expand system coverage through revenue generated by its customers. Bikeshare Hawaii will provide a viable transportation option for everyone, and will benefit both the private and public sector. For the latest updates on Bikeshare Hawaii, visit www.gobiki.org and follow Bikeshare Hawaii on Facebook, Instagram and Twitter. The Hawaiian Electric Industries Charitable Foundation is proud to support and add value to important community initiatives through grants, donations, scholarships, a matching gift program and volunteerism from employees of our family of companies. By doing our part, we hope to fulfill our responsibility to strengthen our communities and serve as a catalyst for a better Hawaii.